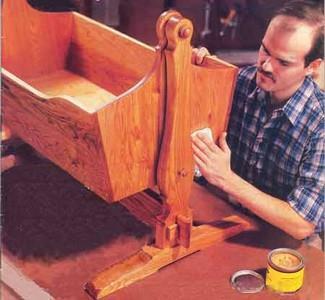 Choose from the free woodworking plans below available for cradles. Free cradle plans and also free baby changing table plans are listed. If you need a cradle, you will also be needing a changing table. 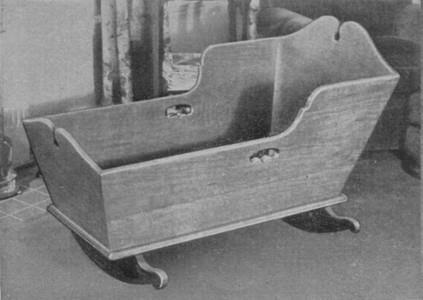 Built to the dimensions given, this makes an Early American style baby cradle. Includes plans, step-by-step instructions along with tips, materials, and tools lists. A wooden canopy and turned rocking treadles make this cradle truly unique. 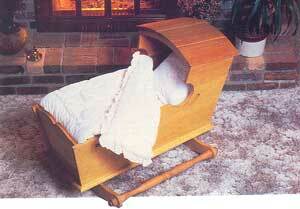 Designed with simple, classic lines, the construction of this cradle is very basic and its' joinery quite durable. 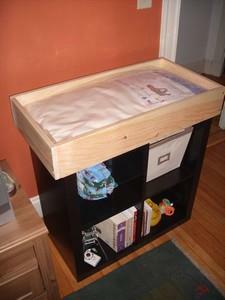 Build a changing table with shelving that is designed to fold out from the wall. Great for small spaces. Build this wooden changing tray that sits on top of a sturdy bookcase with four large cubes for storing baby items.